I will now attempt to write you a short letter that you may know I am well & enjoying myself s well as could be expected. 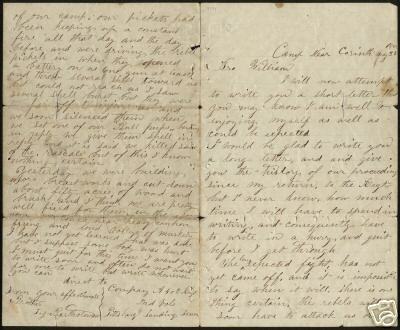 I would be glad to write you a long letter, and give you the history of our proceeding since my return, to the Regt, but I never know, how much time I will have to spend in writing, and consequently have to write in a hurry, and quit before I get through. The long expected fight, has not yet came off, and it is impossible to say when it will. There is one thing certain, the rebels will soon have to attack us or be entirely cut off from all communications. It seems to be the policy of our Generals not to attack them, but to draw nearer and still nearer them until they will have to fight or surrender, and I do not think they will fight much if they can avoid it. I have sometimes thought that they were evacuating Corinth and am afraid they will yet, but if they do not leave soon, it ill be to late, the day lost to them, and I believe victory will perch upon our banners. This is only my opinion, and I may be mistaken and we may have a bloody battle to fight here. 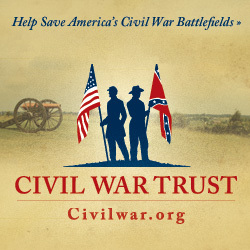 I do not particularly, desire to get in a fight, but if we must fight them at all I do hope that it will be done here, for it is just as good a place for both us, and the rebels to test, and decide this matter, as can be found anywhere in the Southern States. I am sure they will never find a more convenient place and I am sure I never want to march 50 or 70 miles farther South and then have them to fight. We have been called out in line of battle several times lately & expected the �ball was opening� but after a small skirmish all would become still and quiet. Our pickets have been fighting continually for about two weeks and several have been killed and wounded. Last Monday we commenced building breastworks in front of our camp, our pickets had been keeping up a constant fire all that day and the day before and were driving the rebel pickets in when they opened a battery on us (one gun at least) and threw several shell toward us but could not reach us. I saw several shell burst, but they were to far off to injure us and we soon silenced them when we set one of our �Bull Pups� barking in reply we give them shell in reply and it is said we killed some of the rascals but of this I know nothing certain. Yesterday we were building more breast works and cut down about fifty acres of wood and brush and I think we are pretty well fixed for them. In the afternoon we could hear heavy cannon firing and loud volleys of musketry. I have not yet learned what was done but I suppose some body was hurt. I must quit for this time I want you to write soon and often do not wait for me to write but write whenever you can.